Jamie Greubel was born November 9, 1983 in Arlington, Massachusetts and grew up in Princeton. Swift and powerful, Jamie was an accomplished all-around athlete who starred for the track and field hockey teams at the Hun School, a private school in Princeton. She was a coach’s dream—a tireless worker always looking for small ways to improve, and equally good in the classroom. Jamie went on to star for the Cornell track squad, and began thinking about qualifying for the U.S. Olympic team in the heptathlon. She won the Ivy League heptathlon champions in each of her four varsity seasons and was later enshrined in the Cornell Athletics Hall of Fame. As a senior in 2006, Jamie went to the NCAA Championships but finished a distant 13th. Jamie turned her attention to the bobsled after graduation, encouraged by a former teammate on Cornell’s men’s track team. Jamie took up the challenge. She took her first heart-pounding run at Lake Placid and was hooked. She tried to master the sport at the same time she was earning a master’s degree in Elementary Education. Part of that process involved backing on 20 pounds of muscle. Jamie made the U.S. bobsled team during the 2007–08 season. Her teammates nicknamed her The Blonde Dragon. 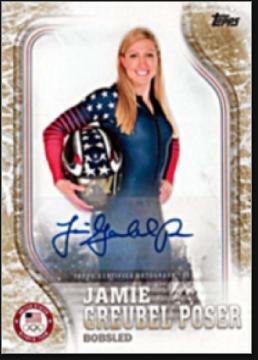 In 2010, Jamie made the U.S. bobsledding team as an alternate brakeman and traveled to the Olympics in Vancouver. She cheered on teammates Erin Pac and Elena Meyers as they captured a bronze medal behind two Canadian teams. After the Winter Games, Jamie switched to driver and her career took off. She overcame a knee injury in 2012—suffered during a team-bonding soccer game—to rank among the top bobsledders in the world by 2014. By then she was engaged to German bobsledder Christian Poser. They met in 2011 at a World Cup race in Canada. At the 2014 Olympics in Sochi, Canadians Kaillie Humphries and Heather Moyse defended their gold medal. Jamie and Aja Evans—the sister of NFL lineman Fred Evans and niece of baseball All-Star Gary Matthews—won a bronze medal with a total time in four runs that was just a second off the lead. The silver went to Meyers and Lauryn Williams who, like Jamie, was a former track and field star. Jamie competed at the 2018 Olympics but did not medal. Germany won gold, Canada won bronze and Meyers and Lauren Gibbs won silver. Jamie and Aja Evans finished fifth—an agonizing 13/100ths of a second off the podium.